Four Thirty Eight & A Half Preston Street has been home to many restaurants. Most famously, for about six months, it was Dunn’s Famous Deli. Before that, it was a loopy little place called Bombay Bollywood, a tiny room dominated by a big hugger called Mariam and a monster Coke machine. BB served Afghani and Indian fare. Then there was Leonardo’s — it used to occupy the back of the building for ages & ages. And so it has gone, this address, from Italian eats to Indian/Afghani to Smoked Meat on Rye, and now to Greek — a first for Preston Street? I do believe so. But someone feel free to correct me. 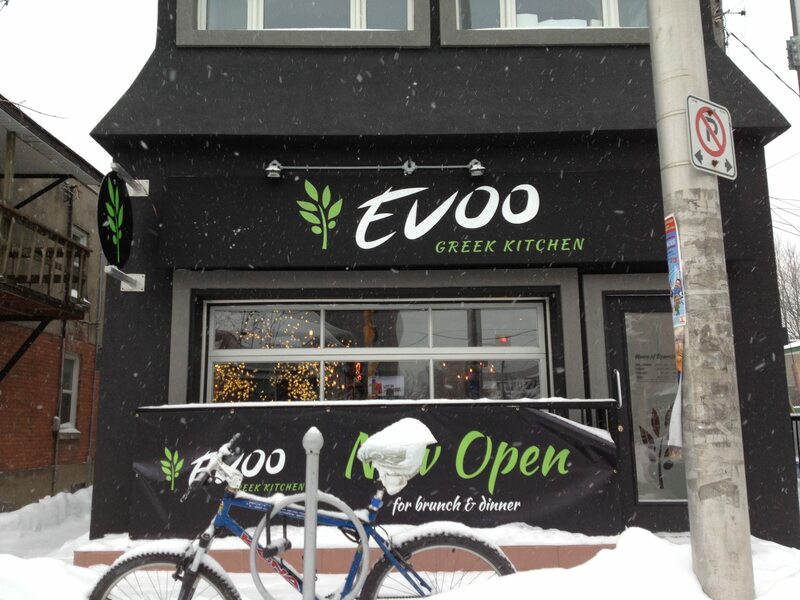 Evoo Greek Kitchen is a one month old family-run place — the husband and wife team of Elias Theodossiou and April Miller (both formerly from the long running — and still running — Rockwell’s, a Theodossiou family restaurant on Merivale.) They seem to operate their new place with an extended brood of siblings and cousins and in laws. Service, led by April, is very much a drawing card. Evoo Greek Kitchen is the latest restaurant to occupy 4381/2 Preston St. Photo by Anne DesBrisay. I took the three-week-old Evoo for a speed date last week. From the lunch menu, the lamb gyro caught my eye, and though the assembly could have used a bit more seasoning, the meat was meltingly tender, the flatbread very fresh, filled in with a splosh of dijon mayo, a pile of arugula, some sliced tomato, rolled up tight in grease free paper. 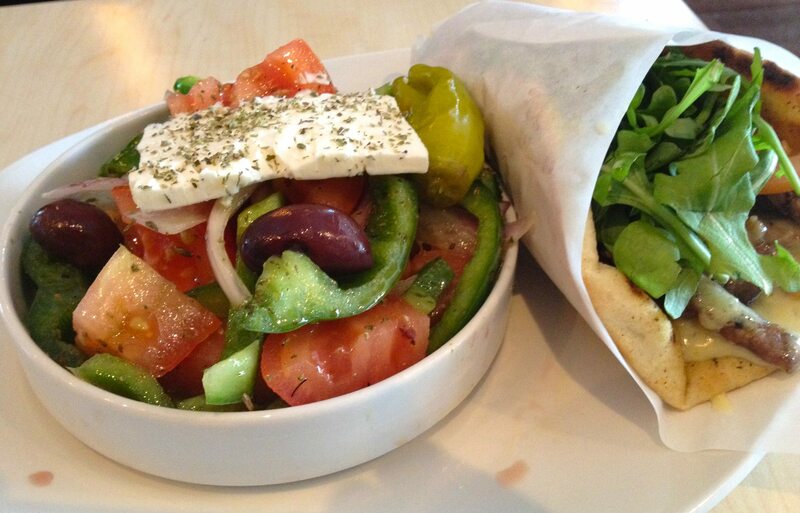 It came with the option to add a Greek salad — fresh, very simple, with quality feta — and the combo cost $12. I managed half. Continued the pleasure at dinner. Mom Theodossiou makes the galaktobouriko — a phyllo-wrapped custard pie — and though I’m sure mom is perfect in every way imaginable, her pastry cream could use a bit less flour. Espresso, however, was appropriately stiff.